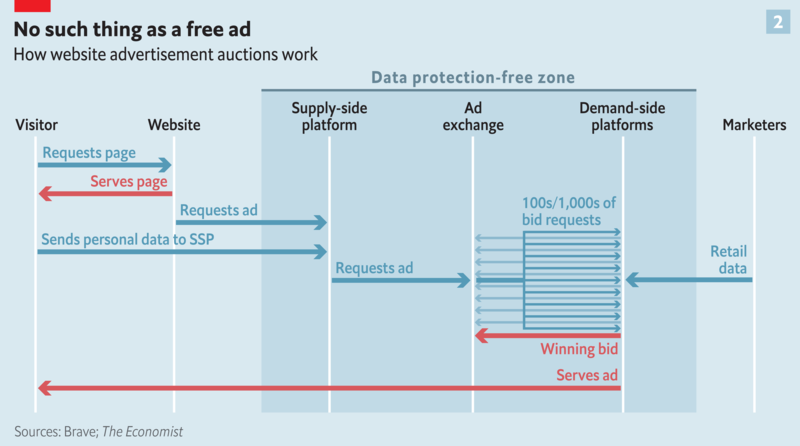 The main briefing in The Economist features the “data protection-free zone” at the heart of the online advertising auction system. This chart is reproduced with permission from The Economist. Download large chart (6000 x 3344 px). The adtech companies, including supply-side platforms, advertising exchanges, and demand-side platforms, participate in what The Economist calls a “data protection-free zone” (see diagram). “the amount of data involved is far greater than that lost to hacking or carelessness in one-off data breaches”. See “Big tech faces competition and privacy concerns in Brussels“, and “Europe’s GDPR offers privacy groups new ways to challenge adtech” in The Economist.